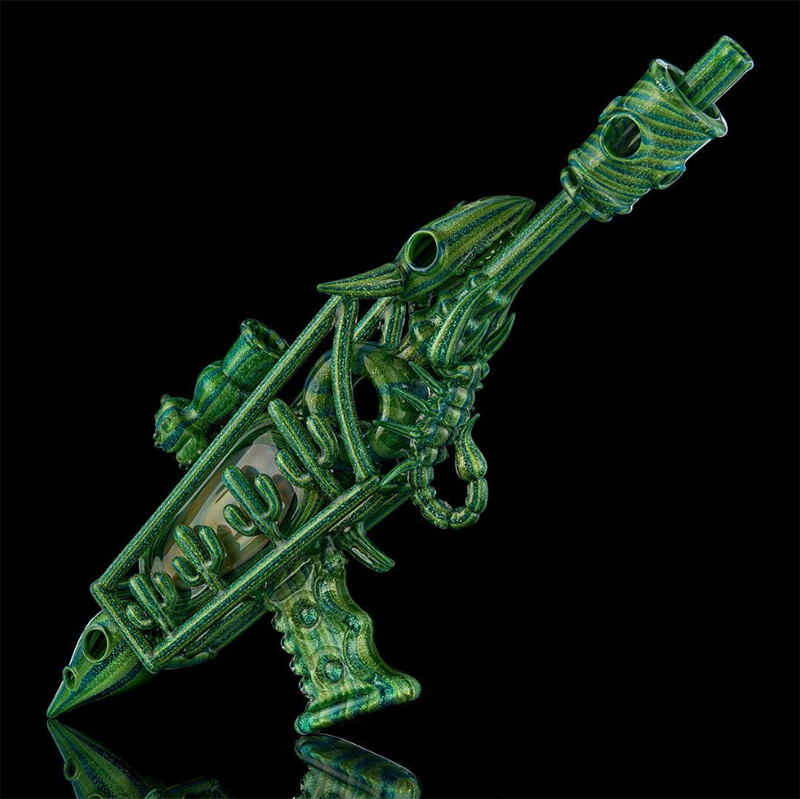 The term Heady glass refers to hand blown functional art, that is created by glass-blowing artists into intricate and often elaborate glass bongs, rigs, and bubblers. Using high-powered torches, glass rods, and skills that have taken years to master, the artists manipulate glass into beautiful works of functional art. With each intricate design, color scheme, and visual motif the advanced glassblowing artistry that goes into these pieces is astonishing. 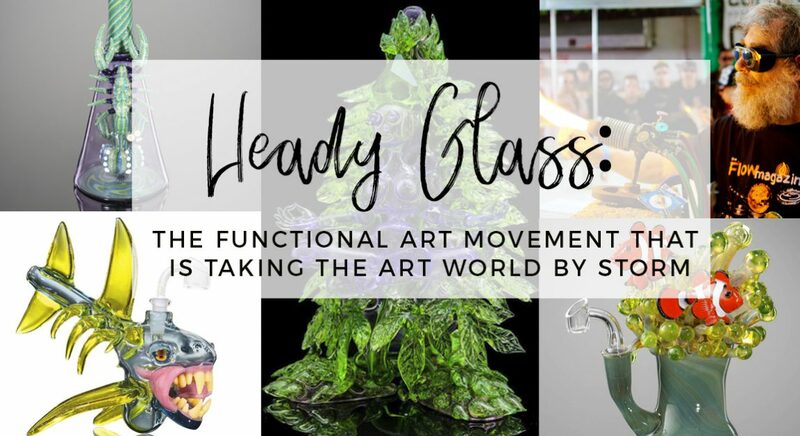 The mainstream art world has just begun to recognize this new medium as a legitimate art form and it’s clear Heady Glass has become a bonafide art movement. 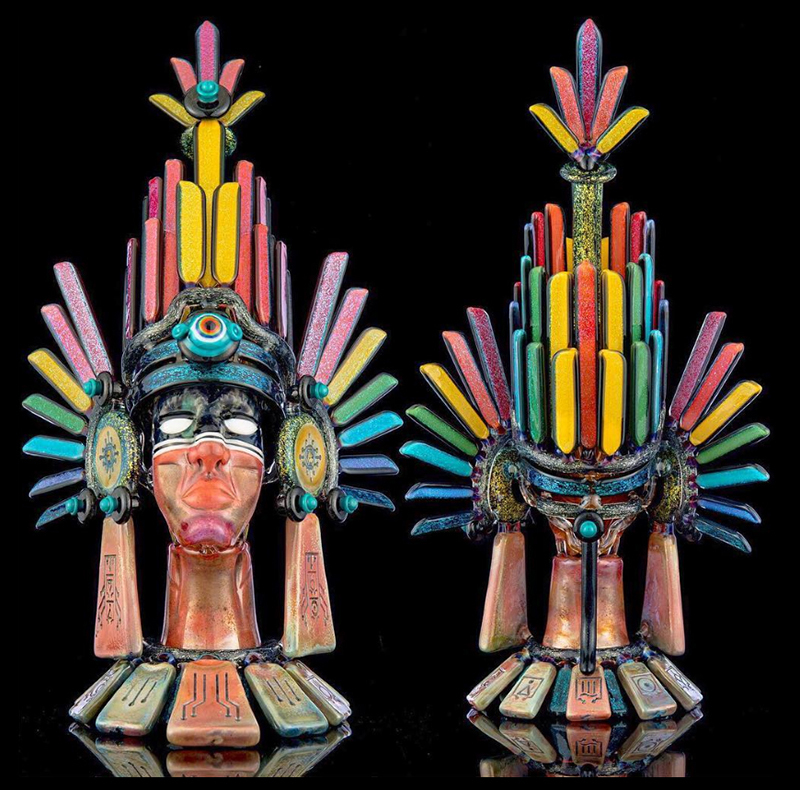 Some high-end handcrafted functional glass sculptures are fetching hundreds of thousands of dollars and fine art galleries devoted to showcasing heady glass are popping up all over the world. “This art gets lost in the head shop atmosphere, in the tradeshow atmosphere, and in the production atmosphere that’s predominantly represented nationwide…” said Reed Berger, owner of the Emerald Glass Gallery in Arcata, California. Berger opened the gallery in 2015 because he was unhappy how this incredible functional glass art was “taking the backseat” to the cheap pieces in head shops. He wanted to recognize these artists’ works that have been put on the back shelf, and Piece Water Solution wants to do the same! Kick back, take your shoes off, and relax because we are going to take you on a tour of some of the world’s most renowned glass art and introduce you to the master artists who make them. Bob Snodgrass making his magic. 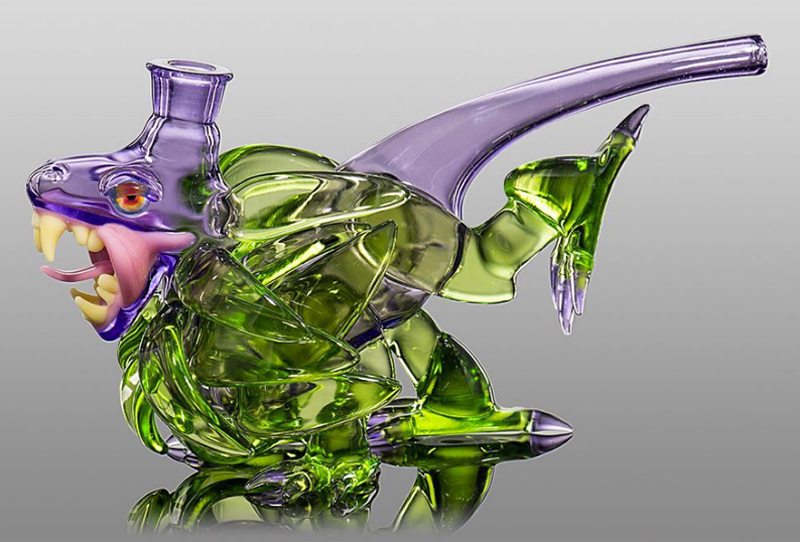 Elbo Glass says that dinosaurs and moons live in his head and that is super evident in his heady glass pieces. Check out his Instagram feed and you will see the dinosaur motif used throughout his works with different color schemes and designs on each one so that no two are exactly the same. He also seems to draw some influence from music and cartoons in his art. Elbo is a big proponent of collaboration as well, and when you check out his works you will see he’s worked with Joe Comer of Cold Drink Glass, Daniel Coyle of Ice Cold Glass, Salt Glass, and several other amazing glass blowing artists. They combine his dino structures for the functional piece with intricate complimentary designs and depictions. 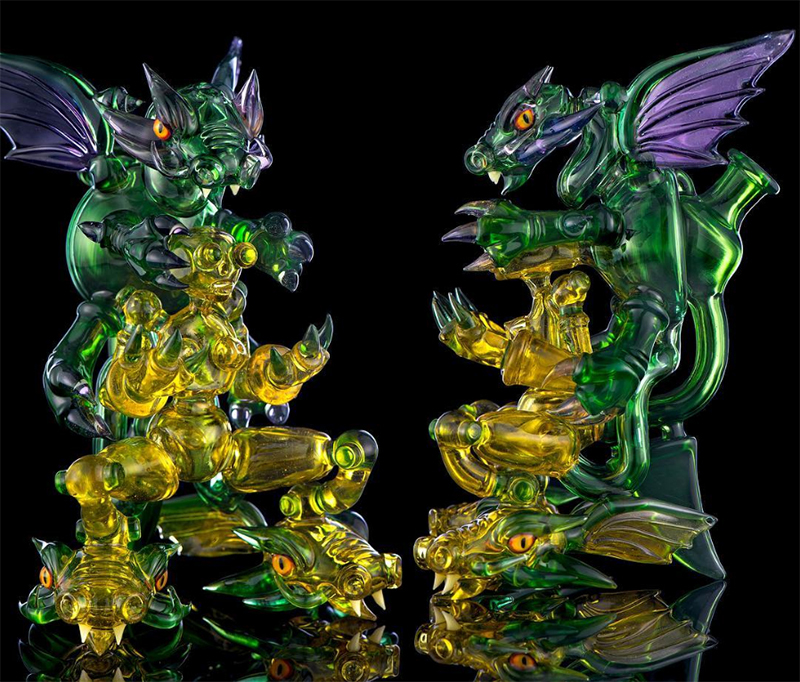 Since he too is based out of Colorado, a heady glass artist hub, he has easy access to these collaborations. Banjo Glass got his name from his epic adventure around the country after dropping out of college with just a homemade banjo strapped to his back. He not only creates amazing functional art pieces, but also shreds on the banjo! He enjoys collaborating with his friends like Joe P and Bluegrass Glass. In June, his work was displayed at Func. Art Gallery in Long Beach, CA alongside many other functional heady glass artists. Banjo is currently based out of Northern California. Banjo’s Feminine Deities are absolute masterpieces of Glass Blowing. This is a collab with the great Mr. Gray Glass. Darby Holm was born in Oregon and is still based there today. He always knew he was meant to be an artist and before he found glass, he was doing any job possible to support his love for painting, designing, and drawing on whatever he fancied to at the time. “Glass found [him] in the mid 90’s like a moth to a light [he] could not look away.” Holm is proud and thankful he got to watch the industry grow into what it is today. His great sense of humor and humbleness shines through when he describes his own heady glass pieces on platforms such as Instagram, which you’re going to want to have a gander at: @darbyholmglass Some of his choice words are “magical,” “sparkly,” “intoxicating,” and “#absolutekrunk.” It is evident that Darby Holm has some serious fun while creating, often integrating cacti, rainbows, sparkles, and other glass artists’ influence through collaboration. 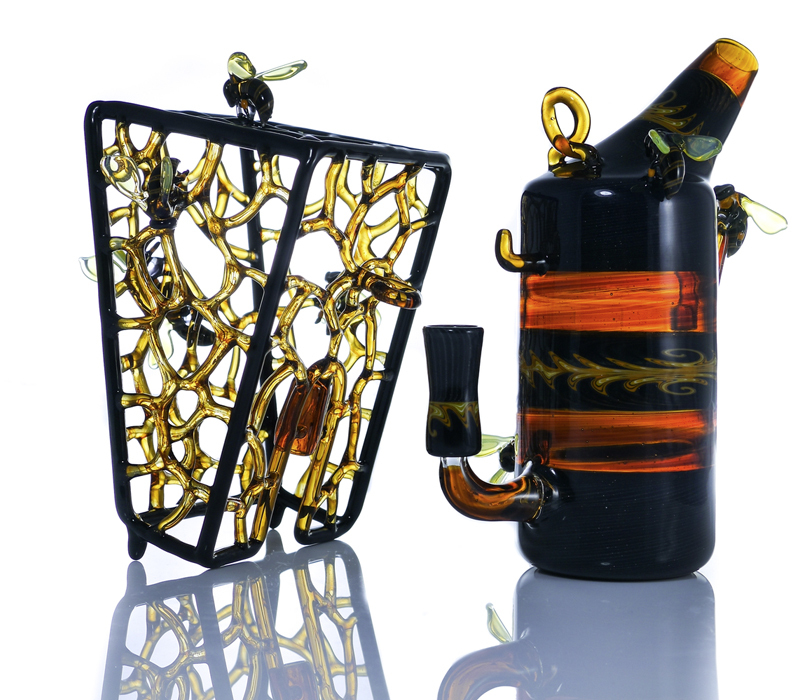 Starting his career in Massachusetts, Joe P made his way to Evergreen, Colorado in order to be closer to the glass community and do more collaborative work. 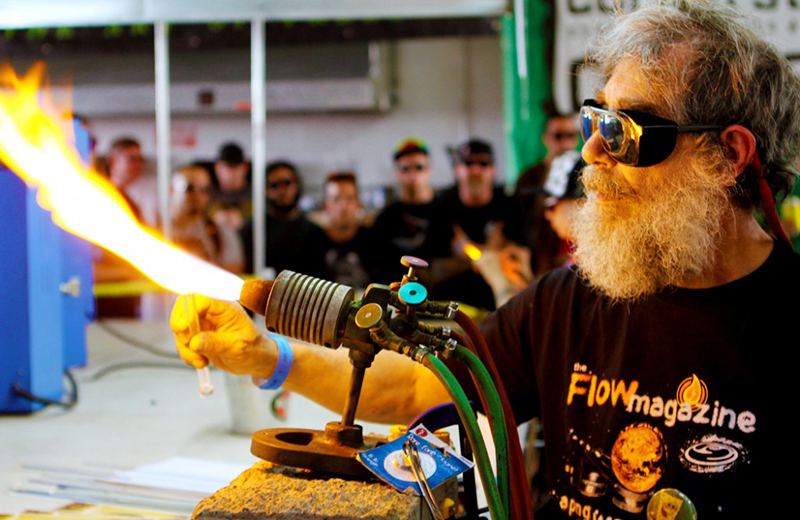 He and Banjo recently just teamed up and created “Camp Wannamakaheady,” a week-long camp in Evergreen where they guided “Heady Campers,” interested in the art, get started and/or hone in on their glass blowing skills. 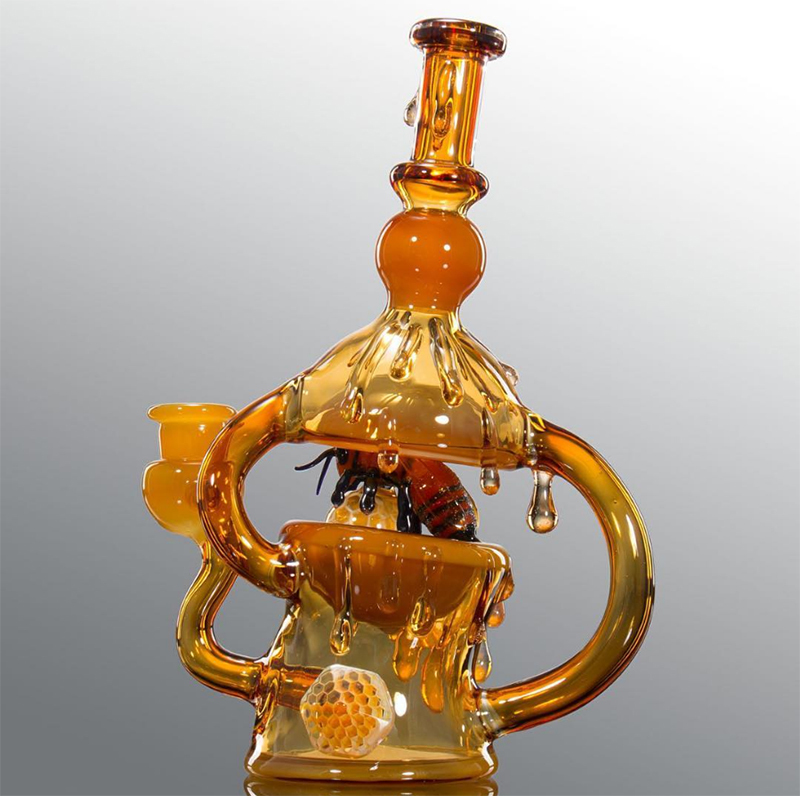 Joe P is obsessed with bees and “honey has been the core theme of [his] glass for many years.” There are a lot of honeycombs and bees buzzing around his pieces. His passion for saving the bees is evident. There is also an influence of the outdoor lifestyle and nature in Evergreen in his works. He collaborated with Darby Holm to create an absolutely beautiful functional teepee piece modeled after the real deal somewhere in Colorado. Check out the gallery on his website and his Instagram to explore all of his works! Phil Siegel, born in Petaluma, California, is now based out of a small town in Washington State. He has no formal training or education in art, giving him his own unique understanding and style of the heady glass medium. Siegel combines his background from construction and architecture with the flowing nature of glass. 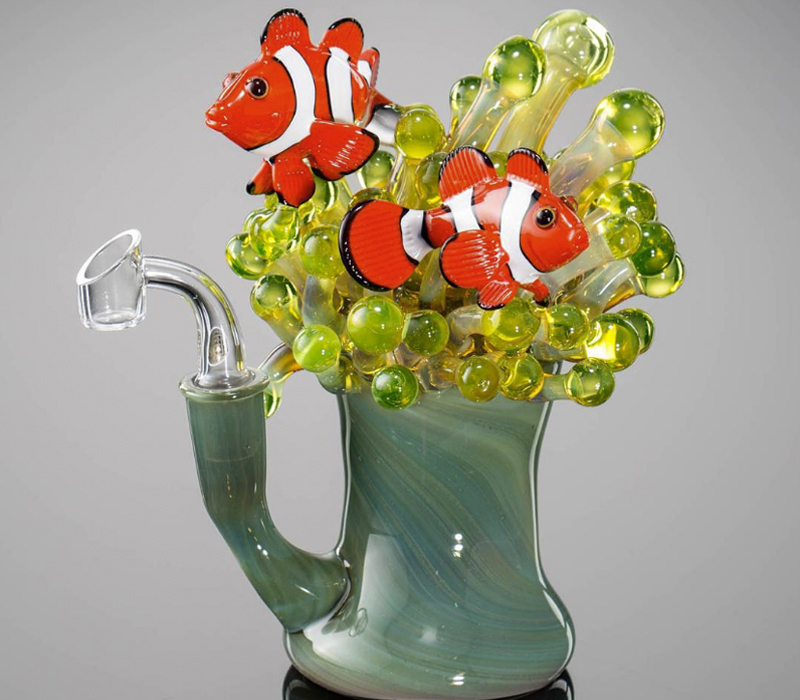 These heady glass pieces are fine art but make no mistake these are functional pieces that are meant to be put to use. This leads to the question how would one go about using and subsequently cleaning one of these heady glass water pipes? Glass is incredibly slick to handle and over the years we’ve seen many a beautiful piece smashed to oblivion during the cleaning process. With heady glass pieces the last thing you’d want is for your valuable piece to be lost to breakage. Tap water into $20,000 work of fine heady glass? I don’t think so. The Piece Water Solution was created in order to solve this issue. Not only will using Piece Water Solution greatly reduce the chance of breaking your glass your hits will be way cleaner and smoother. 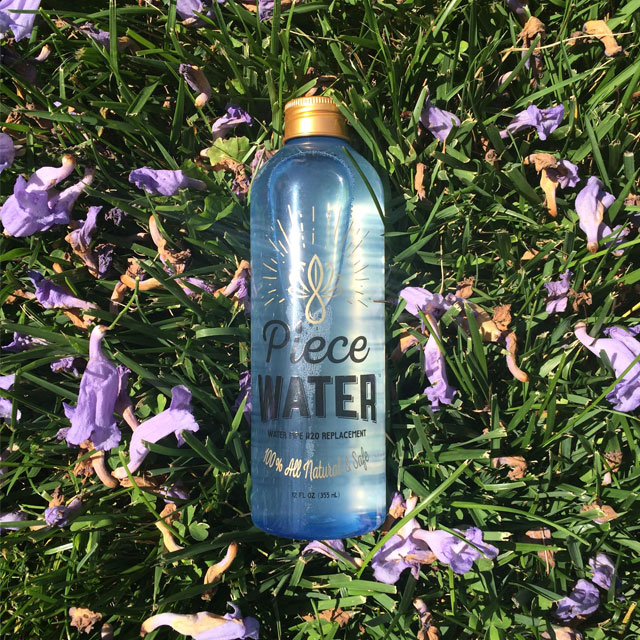 Not just for headies, if you care about your glass, you should be using Piece Water Solution. Obviously there are a tremendous amount of glass artists that have been left out but deserve to be mentioned in this post. We hope to feature each one of them in upcoming blog posts right here.